Home » Commercial Flagpoles » Exposed Rope Flagpole Parts » Internal Halyard Commercial Aluminum Flagpole Parts » What Does a Painted Eagle Ornament Look Like After 10+ Years? What Does a Painted Eagle Ornament Look Like After 10+ Years? In the elements, everything breaks down. Our Flags are particularly treated against UV rays to prevent fading, but eventually, the once brilliant red, white, and blue fades to light red, purple, and gray. When the flag begins to fade, it is time to change. What about other parts on your flagpole? They break down too. Today, we look at this Painted Eagle Ornament. The most common type of eagle ornament is gold (in picture on left). How do you choose the right eagle ornament for your flagpole? The wing span of the eagle ornament is proportional to the height of the flagpole. Take the total exposed height of the flagpole in feet. The wing span of the eagle should be about half that height in inches. For example, a 30 ft. flagpole uses approximately an eagle with a 15" wing span. 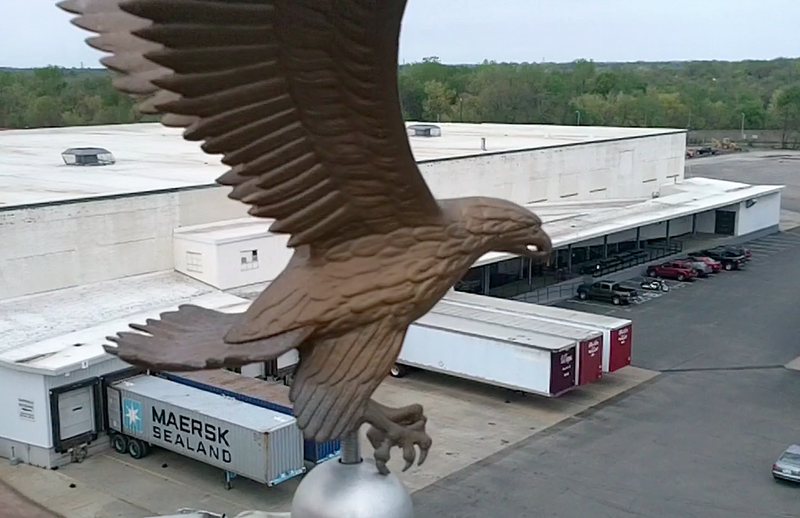 A 20 ft. flagpole should have an eagle with around a 10 inch wing span. This rule works for both residential and commercial flagpoles. One thing to keep in mind with eagle ornaments! With gusts, the flag can fly is all directions. This includes flying up and over the eagle. In storms, the flag can wrap around the wing of an eagle. Sometimes the flag will naturally fall off the eagle, other times, the edges of the wings can snag on the threading of the flag. Sometimes the eagle wins, and other times the flag wins. You want to try and prevent either from happening. If you have an eagle or want an eagle, keep an eye on the flag. Take it down in heavy winds. Have you ever had an experience like this? We'd love to hear from you. Leave us a comment.